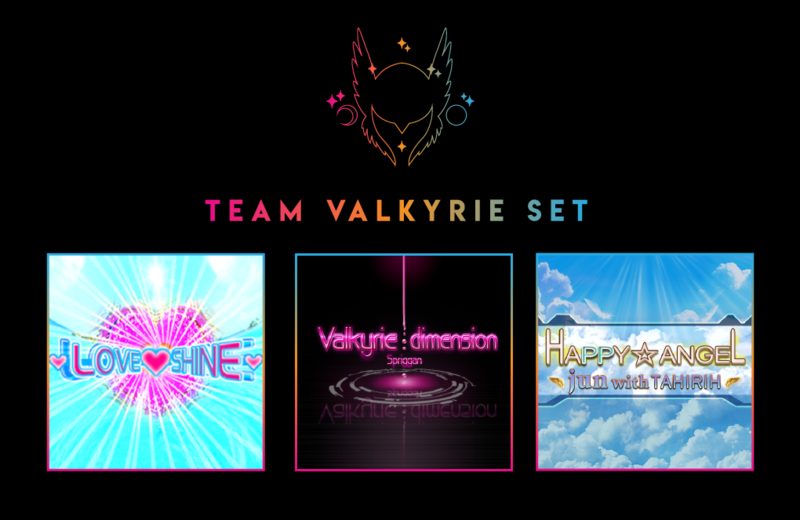 Valkyrie Dimension Unity is an online tournament played on DDR A for women only. There are 3 skill divisions with specific requirements. Prizes will be awarded to the top 3 in each division, as well as bonus prizes to those who complete the additional challenges. SANDBAGGING IS NOT ALLOWED. This means that you must pick the appropriate division for your current skill level so that you will be competing with girls on the same skill level as you. Dropping into a lower division in order to easily dominate the competition is against the spirit of this tournament. The divisions are meant to push you to improve. > You have NOT passed more than one level 14. If you have passed 2 or more 14’s you cannot be in this division. > You are NOT able to consistently AAA or PFC level 12 songs. 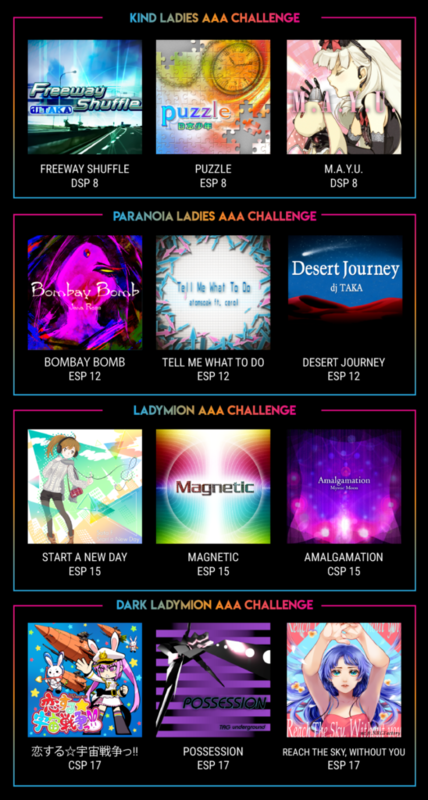 Kind Ladies division includes levels 8-12. If you can consistently pass level 14’s and above, this is not the division for you. > You have NOT passed a level 17 song or higher. If you have a 17 you cannot be in this division. 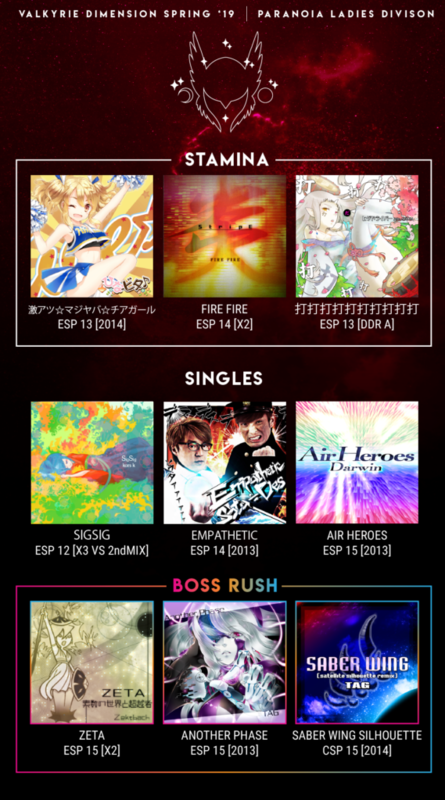 > You are NOT able to AAA or PFC 15’s. The highest level in Ladymion is a 18. If you have passed a 17 you MUST be in this division. If you do not follow the placement rules, you will be disqualified or asked to move to a higher placement. Play these 3 songs in the same game. The scores count together, you must do your best on all 3 songs in the set at once! 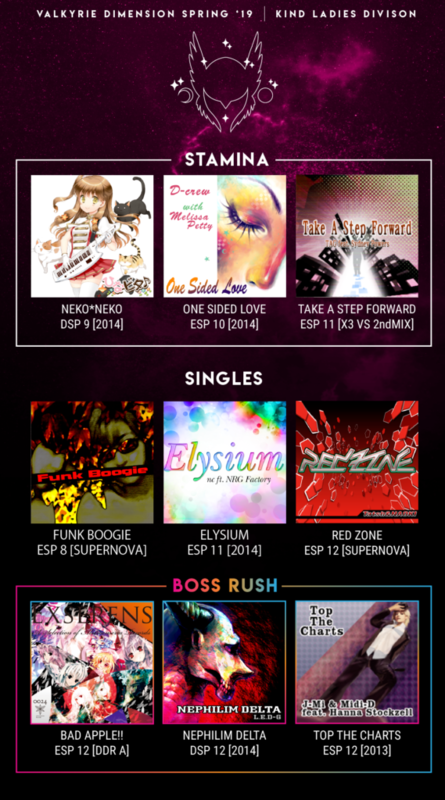 You may replay one of the songs in the extra stage, if you want. You must play the 3 songs one after another. For Example: You would NOT be able to do 2 of the songs in the set, then a different song that is not in the set, then do the final song in your set in extra stage. You can play these songs with any other songs in a set. Play them as many times as you’d like at any time. > You can update your scores as many times as you’d like! > EX Score is counted, so please check that you improved that score before submitting an updated score. > Only scores made within the tournament time period will count! In addition to the trophies for 1st, 2nd and 3rd place there are also bonus prizes! Objective: Pass 3 difficult songs in the same set! Conditions: You must also submit scores for the regular tournament. You must complete the challenge for the division you are competing in. You may use turn mods, but you cannot turn off holds or use cut, etc. 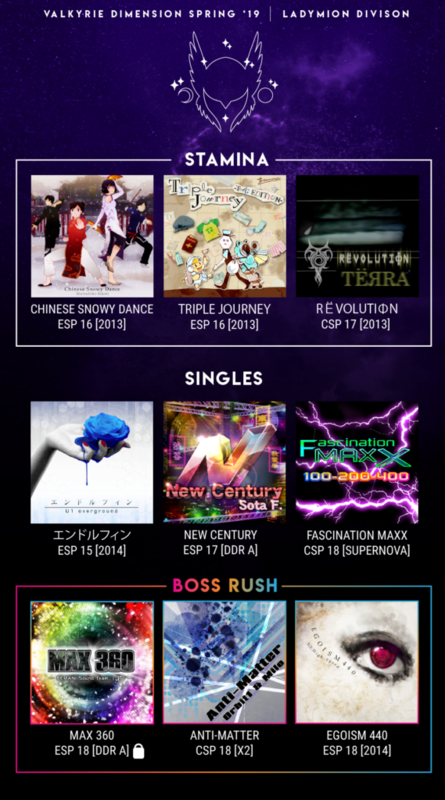 You must take a full photo of the results screen showing your scores and that you played all songs in a set, with your eamuse tag clearly visible. Objective: Score a AAA on 3 songs in a set! Conditions: You must also submit scores for the regular tournament. You must complete the challenge for the division you are competing in. You may use turn mods, but you cannot turn off holds or use cut, etc. If you are a Ladymion, you can choose between the set of 15’s or the set of 17’s!